SolidWorks Part Modeling: Required Sketch Entities, Sketch Modification, Sketch Relations and Dimensions, Features, Material and Mass Properties. 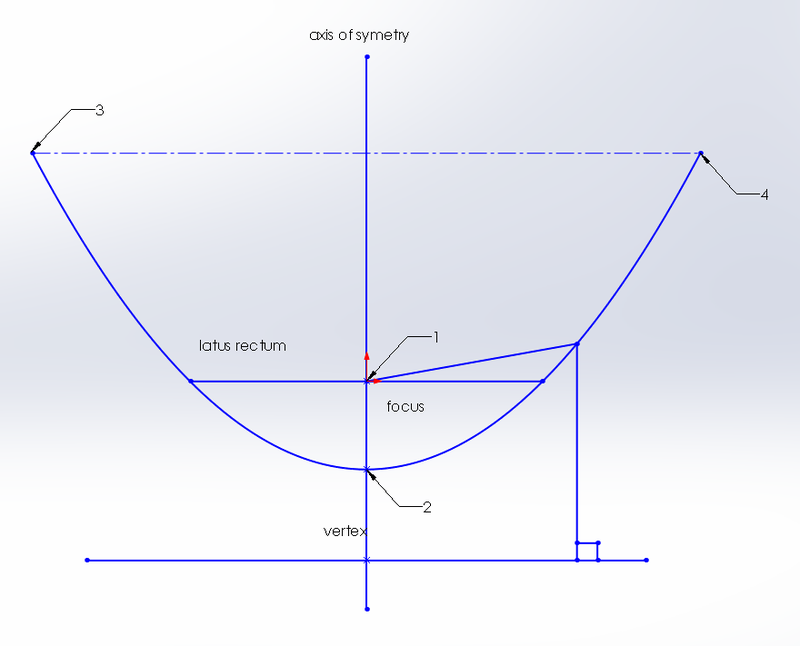 Conics: The Conic tool lets you sketch conic ((thuộc) hình nón, (thuộc) mặt nón) curves driven by endpoints and Rho value. Depending on the Rho value, the curve can be elliptical, parabolic, or hyperbolic. 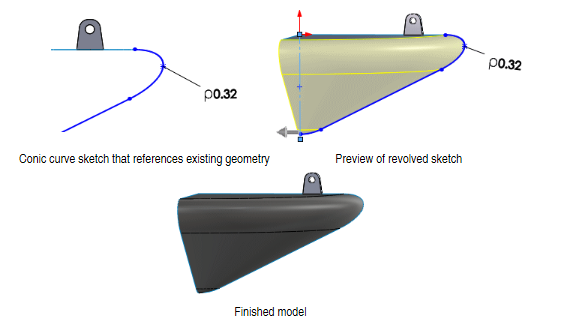 Conic curves can reference existing sketch or model geometry, or standalone entities. You can dimension the curve with a driving dimension, and the resulting dimension displays the Rho value. The conic entity also includes a value for the radius of curvature. The Toolbox is a collection of several powerful tools built into SolidWorks. Its can increase productivity and decrease the time required to complete a design. These components can be configured to easily populate Bills of Material with part numbers descriptions or any other custom information that needs to be easily displayed to the user. Toolbox Installation: By default most users will leave all standards selected, in the Product Selection tab standards can be excluded from the installation. The second part of the installation that pertains to toolbox is the file location and file name of the toolbox. This is on the “Summary” tab in the installation window. By default the toolbox is saved to the C:\ drive and it’s named “Solidworks Data.” Both the location and name of the toolbox folder can be changed by simply selecting change. Migrating Toolbox Files to a Network Location or PDM Vault: There is one major deciding factor to determine if moving the toolbox to a network location would be advantageous. If the intent is to customize the toolbox with part numbers, custom properties, or add hardware restrictions a network based toolbox would likely be beneficial. There are several infrastructure restrictions to having a network based toolbox. The first is all users will need to have constant access to a network location. This location will also need to have low latency. Any slowdown in data over the network will negatively affect program performance during operations that involve toolbox components. Tools —» Options —» (tab) system options —» Hole Wizard/ Toolbox. From here the file location can be changed from the default location on the “C:” drive to the network location. The address can be manually typed or browsed to by selecting the “…”. Once this location has been changed Solidworks will look to this location for toolbox components. There are additional steps to finish setting up the toolbox to work with PDM. After adding the toolbox to the vault, check in the entire file structure. This can be done by selecting root folder “SOLIDWORKS Data” and selecting “Check in”. This process could take some time since the toolbox contains a large number of files. Once the toolbox has been checked in the PDM system has to be configured to manage toolbox components. To configure these settings, open the administration tool and select toolbox. Select Manage Solidworks toolbox in the vault and define the path to the root of the toolbox. Ex: C:\\Solidworks Data}. Once this has been completed see the PDM information in the section “Toolbox File Type” for information on how to configure settings in the toolbox that will optimize it for use in a PDM environment. Upgrading Toolbox Manually: It's recommended to upgrade the toolbox automatically. Before upgrading the toolbox, it's recommended that a back-up is made and moving that copy to a safe location will be sufficient. You cab right click on the folder and choose Send to —» zip. This step isn't required for PDM users since previous versions of the database are indexed in the vault and can be rolled back. Now need to navigate to —» C:\Program Files\Solidworks Corp\SOLIDWORKS\toolbox\data utilities\. If the folder was renamed during installation, then it will show by the specified name. Navigate In this folder find and launch the application: “Update browser database”. Once in the utility some information will be provided, and some will need to be selected. First, it will display both the directory to the toolbox and its version. This is loaded from Solidworks, if this window is blank simply navigate to the database file “swbrowser.sldedb” it exists at \lang\english. The application will automatically fill out the updating database information. It will reference the folder used to launch the updater from, since this folder contains the updating information. Before using the updater check out the database file swbrowser.sldedb, in the case a file named swbrowser.sldedbold is also found in the directory it will need to be checked out as well. Run the update utility. Once this is complete the toolbox will be updated. Test functionality by launching the toolbox inside of Solidworks. After the update check-in the database and have users get latest so the changes are reflected for all users. The toolbox can populate bills of material, contain materials, and automatically be added to assemblies. These functions, though powerful, must be configured up by the user(s). Permission: Toolbox contains its own permission structure to limit individual user’s ability to edit specific parameters linked to the toolbox. To activate the toolbox permissions simply create a password and security phrase to lock the toolbox. After this has been created all users wishing to change locked aspects will need the administration code to do so. This limits the users from being able to make changes with unintended consequences. Each Content, Custom properties, Adding, Part Numbers, Editing Configuration Names setting has a specific purpose. Toolbox Settings: The toolbox has a variety of settings that require configuration for the best utilization of the toolbox program. These control how the toolbox functions internally along with what data will be displayed to the user while they utilize the toolbox inside of solidworks. To edit the settings associated with toolbox launch the toolbox settings program ( or choose configure toolbox inside of Solidworks) and select option 3 “Define user settings”. The first major setting is whether toolbox will create parts or configurations when hardware of a new configuration is used. This is an internal setting and will not change how the user interacts with the toolbox utility. Create Configurations will add a new configuration to an existing toolbox file each time a new toolbox size is used. This will lead to very large files with a large number of configurations. This setting can see reduced performance in large assemblies. Create Parts will create a library of files each file representing a single configuration of a toolbox file with a single specific size. This setting will create a large volume of part files but each of these will have a very small file size. Create Parts on Ctrl-Drag is a hybrid of the two versions previously mentioned, it will act like create configurations except for when users press CTRL while dragging components onto the screen. If either method that causes the creation of parts is selected. A folder location will need to be defined to have generated part files deposited into. Solidworks has included a blank directory into the Solidworks Data folder named “Copied parts”, this or any other directory can be defined. It’s recommended to use a directory inside of the toolbox though so that when backups are taken they include all generated toolbox files. In general drawing templates are used to start a new drawing. A sheet format is an overlay or title block that we might see on the initial drawing template, but it can be hidden. Also, sheet formats are useful on multi-page drawings as you might want a different looking title block on subsequent pages in a multi-page drawing. Sheet Format (.slddrt): The sheet format file has the file extension .slddrt. The .slddrt file is the file containing the sheet format - the geometry and notes that make up the drawing’s title block. This also contains the anchors for the BOM, Revision Table, etc. Users can save off sheet formats from active drawing files. File —» Save Sheet Format. Drawing Template (.drwdot): The drawing template has the file extension .drwdot. Drawing templates contain all the document specific information that is found in the Tools —» Options —» Document Properties dialog. This includes specifications for units, drafting standard, font selections, arrow sizes, pre-defined views, etc. Some drawing templates may be saved with a sheet format already selected, or they can also be saved as a blank sheet with no sheet format visible. Default Templates —» Tool —» Options —» Default Templates —» Part: c:\Programs\Solidworks\Solidworks 2018\templates\Part.prtdot —» Part: c:\Programs\Solidworks\Solidworks 2018\templates\Assembly.asmdot —» Drawing: c:\Programs\Solidworks\Solidworks 2018\templates\Drawing.drwdot —» check Prompt user to select document template —» OK.